In the forthcoming novel, The One is a reality show premiering on network television on Valentine’s Day and is viewed as a direct competitor to The Bachelorette and The Bachelor. But unlike The Bachelorette and The Bachelor that has never, in the combined twenty-two seasons, showcased a non-white contestant in the title role, protagonist Olena Day is both black and in her mid-forties. I wanted to write about love and put a different face from what is often shown on TV. When author Cheryl Robinson decided to write a book centered around a reality show, the issue of the negative portrayal of women, in particular black women, on reality shows quickly surfaced. The debate wasn’t whether women of other races are also shown behaving badly because one can point to Jersey Shore, Bad Girls Club, and a few of The Real Housewives series and instantly realize that women of other races have also been depicted in a way that is both damaging to themselves as well as other women. However, in the case of black women, the balance between positive and negative imagery in the media is often skewed to portray them as being loud, angry and argumentative. In the novel, the fictionalized reality show premieres on network television on Valentine’s Day and is viewed as a direct competitor to The Bachelorette and The Bachelor. But unlike The Bachelorette and The Bachelor that has never, in the combined twenty-two seasons, showcased a non-white contestant in the title role, protagonist Olena Day is both black and in her mid-forties. Robinson also put the adage of never say never to use to come up with the plot for her forthcoming novel, The One. Olena Day, an aspiring writer, dislikes reality TV, but decides to take the opportunity to star in the new reality show, in hopes of securing a book deal. The relationship-driven novel takes readers behind the scenes of a dating reality show and deals with love (both real and scripted) from the points of view of Olena Day and her on-again, off-again beau, Jason Nix, a former NFL star turned sports commentator, who apprehensively reenters the dating world after Olena becomes preoccupied with reality TV stardom. 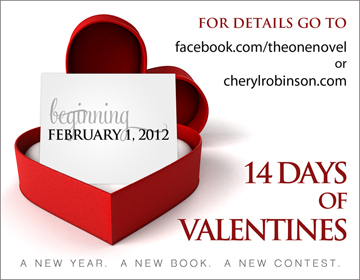 The author will be hosting 14 Days of Valentines at http://www.cherylrobinson.com/blog and http://www.facebook.com/theonenovel. The official entry period begins February 1, 2012. Fourteen prizes, mostly gift cards, will be given away. The contest is being sponsored by Second Chance Motors. Cheryl Robinson has written eight novels, including the best seller In Love with a Younger Man. She is a native of Detroit and currently resides in Central Florida. For more information, visit the author’s website at http://www.cherylrobinson.com.